It is festival season with Diwali just around the corner. I miss the festivities here that we had in India. Over the years we have started celebrating few festivals in a small scale. Ganesh Chaturthi is one festival which we celebrate every year without fail. We think of inviting all our friends but that hasn’t happened yet. We completely focus on a nice pooja with a good spread of food. This year it was a really packed day, I still made a big spread. For sweets, we usually have 5 kinds of sweets. I wanted to pick something simple, so I made these fig burfis. 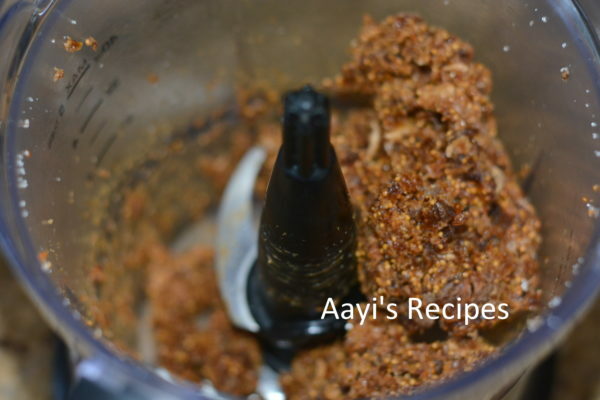 I bought Figs/Anjeer for the first time to make smoothies. I initially thought of making anjeer modaks but later went with just the burfis. The pictures do not make justice to this dish. I tried to click a good picture but failed and gave up after a few trials. You have to trust me when I say they tasted amazing. Chop figs into small pieces. Take the pieces and sugar in food processor and pulse them till they are well mixed. Heat ghee and add the mixture. Mix it for a couple of mins(just to warm it through). Take off heat and add cardamom powder. 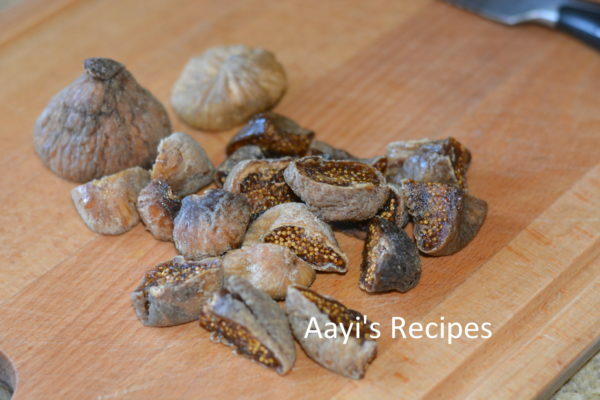 Make small balls of the mixture and press them slightly to give a peda like look, or cut them into desired shapes. 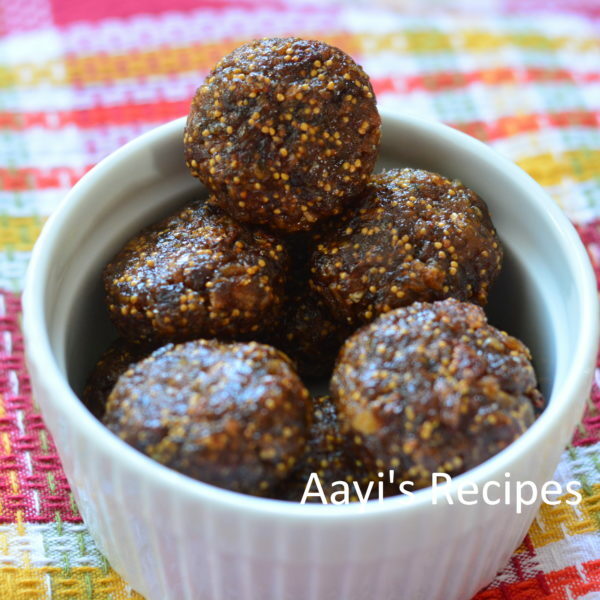 very easy to make and seems to be a delicious in winter season. Thanks for easy and delicious recipy. These look lovely and a healthy snack too! How long do they stay fresh? Looking awesome & easy to prepare. Thanks for sharing. Can we add dates instead of sugar ? 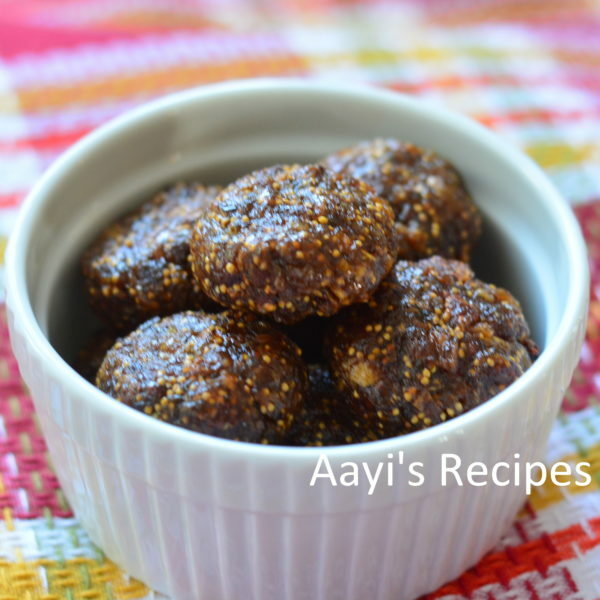 Hi Shilpa – are these the fresh figs or dried ones?